Width appx : 2.1 mm. Length : 22" (also available in other sizes). Weight appx : 1.7 grams. Fantastic italy FORO designer estate necklace, crafted of 14k rose, yellow & white gold having a beaded / bib / tier / multi strand design, completed with a spring ring clasp. PURITY 14K. TYPE Italy Necklace. 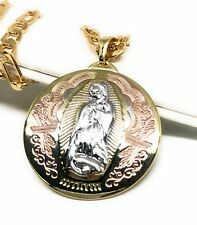 ---Brand new 26 inch gold laminated chain with virgin Guadalupe tri color medal. 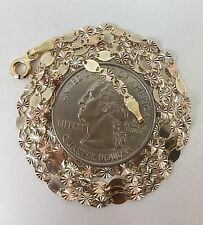 ---Chain is 5mm in width. ---Comes packaged inside an individual box. FORO Italy 14K Tri Color Gold Beaded Bib Tier Strand Necklace 15.5"
Beautiful 6 strand braided sterling silver tri-color necklace chain. Yellow gold, rose gold and silver colors, 2 strands of each all braided into this 17 1/2" long x 3/8" wide. This weighs 19 grams and has a spring ring clasp. Finished in goldtone and signed. Width : 2.1 mm. Length : 24" (also available in other sizes). 14K Tri-Color Gold Sand Finish Ball Beads & Finish Star Charm Pendant with 17" Singapore Chain Necklace. We are proud of the joy and happiness we have provided thus far and hope to provide even more. Tri Color Sterling Braided Herringbone Chain. STYLE: Braided. TYPE: Necklace. We do not repair or size jewelry, nor do we clean it. Tri Color 10K Yellow Gold Valentino with Star Chain Necklace 18"
Muy bonita, elegante. Solid 14K tri color Gold Chain or necklace looks beautiful very delicate and elegant, thin. Look Pictures for details. oro de 14K GARANTIZADO. 16" Lenght. esta cadena Mide 16" de largo es corta y delgada muy buen tamañoestilo gargantilla tiene 1.3mm de ancho y pesa 1.3 gramos Perfecta para dama. Es delgada brillante y muy bonita. Solid 14K tri color Gold Chain or necklace looks beautiful very delicate and elegant, thin. es oro de 14K GARANTIZADO de 3 oros ( Amarillo, Rosa y Blanco). Hecha en Italia de gran belleza y calidad. Stampato "hugs and kisses" design. Hypoallergenic, nickel and lead free stainless steel.